While it may not have seemed it at the time, the 2015 USL Cup served as a watershed moment for the USL Championship. Not only did the game serve as the first under the banner of USL Productions, it was also the first game in the league’s history to be aired on an ESPN platform. Fast-forward three years and that night’s broadcast on ESPN3 could now be viewed as a portent of what was to follow as 2018 saw the United Soccer League and the Worldwide Leader in Sports strike a two-year agreement this past April that made the USL Championship one of the initial offerings on its new ESPN+ service. Eight months on, the USL Championship stands alongside top domestic and international soccer competitions from around the world, boosting the league’s visibility across the United States to an unprecedented level. 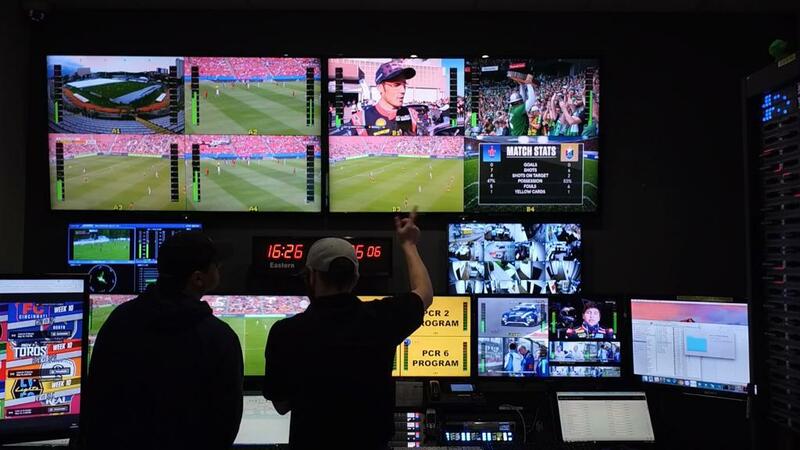 More than 450 games aired on the new service this year, while the league’s broadcast package on ESPN2, ESPNews and ESPNU expanded to include six regular-season games aired during the summer. Perhaps most notably, the first year of the new partnership was capped by the first airing of the USL Cup on ESPN2 in the United States and ESPN International in more than 50 countries around the world, which gave the league’s championship game its broadest audience reach ever and provided a fitting platform for legendary forward Didier Drogba’s final professional bow in Phoenix Rising FC’s colors. While the partnership with ESPN was a major step forward for the league, the role that USL Productions played in the Championship’s expanded visibility shouldn’t be underestimated. The USL’s partnership with Vista Worldlink – and the investment made in creating arguably the largest Remote Integration production structure currently operating worldwide – has been transformative for the league’s clubs, opening the door for local broadcast agreements in more than two-thirds of the USL Championship’s markets this past season. Those agreements have created valuable revenue streams and brought USL Championship broadcasts to markets that boast a population of more than 84 million across the United States and Canada. And while the USL Championship has thrived on a regional level this year, ESPN+ has also gone from strength to strength, surpassing more than 1 million subscribers in September. With properties like the UEFA Nations League, Italy’s Serie A, Major League Soccer, Australia’s A-League and the English Football League, the new service has given viewers the opportunity to watch great soccer from around the world in addition to a wide variety of other top-level competition in other sports. As the Championship gears up for what will be the fourth full season in which the league’s games will air on ESPN’s platforms in 2019 the partnership between the two organizations will continue to grow, providing the top-class production fans around the world have come to expect. With seven new expansion markets joining the Championship for the new season, including six that rank in the Top 60 Nielsen markets in the United States, the league’s broadcast reach will continue to grow. With more than 625 games to be played in the 2019 Championship regular season and USL Cup Playoffs, there will be no shortage of action for fans to enjoy when the season kicks off in March across the league’s digital and broadcast networks.